In this installment of the series, we’ll hear from three pitchers — Jon Gray, Mark Gubicza, and Garrett Richards — on how they learned and developed their sliders. “I started throwing a slider in probably 2012. I first learned how to throw a slurve, and that taught me how to throw a slider. I remember my uncle teaching me to throw one. He was like, ‘Don’t be throwing curves. You need to throw slurves and cutters, so you don’t mess up your arm.’ He didn’t want any action on my wrist. “I learned how to throw that, a slurve, which is kind of the basics of a slider. In high school, I didn’t really have a grip. I didn’t know how to hold one, I guess. I just kind of made up my own grip and went with it. I didn’t watch baseball growing up — I watched none — so it was kind of hard. “When I got to college, I had my first pitching coach. He showed me how to hold a slider. That’s when it really took off. That’s when I learned how to spin it, why it needs to spin, and how it moves. The way I’d been holding it before was crazy different. I was holding it like a two-seam. “I’d say I learned how to throw it like a fastball my second year of college [in 2013]. I learned how to throw it as an out-pitch, so that it would be there and gone. That’s kind of how it started getting good. I wanted a pitch that looked like my fastball. I wanted to be able to bring the heat and keep them guessing. “When I was drafted by the Royals, in 1981, I was a four-seam fastball guy with a curveball. No changeup, really. Just those two pitches. The first day I got down to rookie-ball camp, they said, ‘You’re throwing a two-seamer sinker, and a slider. We’re going to go with that.’ They wanted harder throwers. At the time, the Royals had a lot of left-handed pitchers at the major league level who didn’t throw overly hard. In that draft, we had David Cone and myself. Bret Saberhagen was the next year. Danny Jackson was in that group. “They said to think about a slider in terms of throwing a football as hard as I could. The way your wrist is [throwing a football] is basically what you do with a slider. A curveball is straight over the top, more a turning of the wrist. The arm action on a pitch is longer than throwing a football, but at the end, as far as the release point goes, it’s similar action. 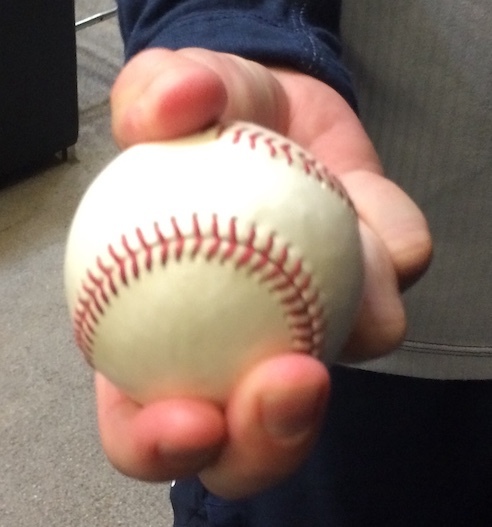 “I learned to throw a slider pretty quickly. Over time, I started to develop more and more feel, to where it became one of my better pitches. I got to where I could change speeds on it. It might have been my best pitch. “I didn’t really start throwing a slider until my junior year of college. I had a pitching coach my summer in Alaska — his name is Ryan Heil — and he taught it to me. That set me up for my junior season. “I started out learning it by just kind of letting the grip do the work, and having the mentality of throwing it like a fastball. As I became more comfortable with it, and got a consistent break out of it, I began to shape it a little bit. I’d pick out a spot I wanted it to start, and a place for it to end. It took me a little while, but really, the slider was a lot easier than some of the other breaking balls I’ve tried to throw in the past. “It’s evolved. 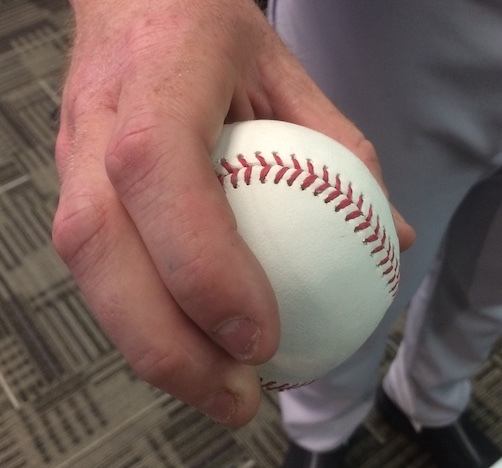 It’s not so much a grip-it-and-rip type pitch anymore. Now I have a feel for it. I’m able to throw it for a strike. I’m able to throw it when I’m behind in the count. Fastball-slider is kind of the bread and butter for me. It’s become a pitch I can always go to. We hoped you liked reading Jon Gray, Mark Gubicza, and Garrett Richards on Developing Their Sliders by David Laurila! Gubicza’s story of his first day of rookie ball is a little concerning. Hey, remember everything you did to get yourself drafted? Yeah, let’s scrap that and make you into a completely different pitcher.